1 Set=3 Pieces,Made of 8MM Quality Wood and Natural Lava Rock Stone, Environment Friendly and Comfortable to Wear. MULTIFUNCTIONAL:Adding Some Drops of Essential Oils to Porous Lava Rocks Will Leave Lingering Fragrance, Also Can Protect yourself from Mosquito and Bug Bites. UNIQUE CHINESE KNOT DESIGN:Symbolizes Family Harmony, Good Health and Luckiness,Wonderful Gift for Your Families and Friends. 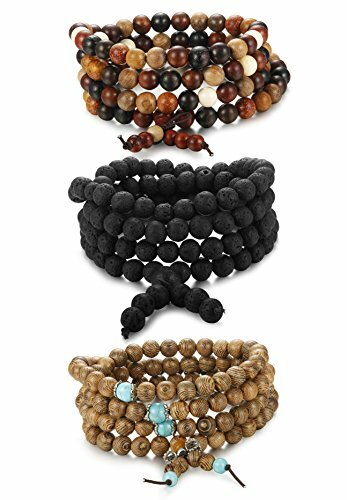 108 Buddhist Prayer Sandalwood Lava Rock Stones Stringed with Sturdy Elastic Cord, Perfect Wearing As Necklace or Bracelet. Purchase Without Worries: 120-day Exchange or Money Back Guarantee and Excellent Pre-sale Consulting and After-sale Customer Service.